This Double-Sided Illuminated Round Mirror has an elegantdesign with variable swivel, foldable and height-adjustable function. TheCosmetic Mirror provides magnification options to display a clean reflectionwhenever you need it. The Compact LEDVanity Mirror is ideal for precise eyebrow tweezing, applying make-up, wearingcontacts and shaving etc. Great for usage in bathroom, hotelsand day spas..
High quality two sided circular glass mirror. Provide the most accurate natural light you will encounter throughout the day. Cordless/wireless, hence makes it easy to be placed anywhere. Made of chrome plated, iron frame. 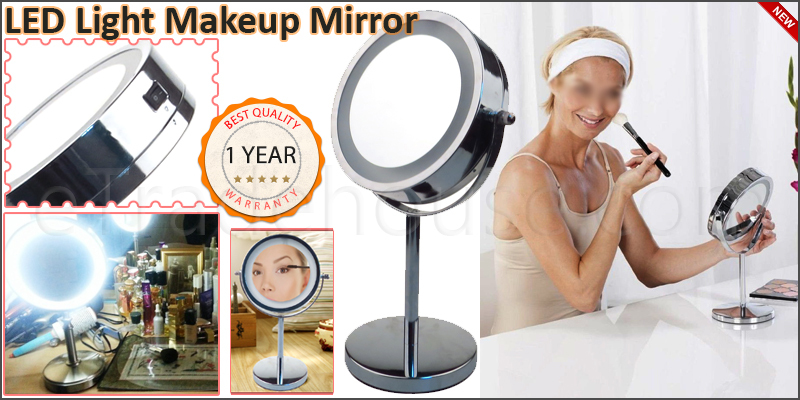 1x Round Magnifying LED Make Up Cosmetic Vanity Mirror.